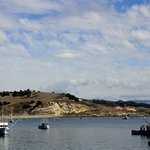 Avila Beach is another hidden jewel of the California Central Coast. It is hidden in the San Luis Obispo Bay and if you don’t go there on purpose, you will never see it. 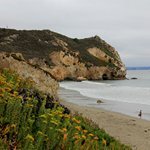 Avila Beach is well hidden from the 101 freeway by a beautiful forest and some very tall hills. These hills provide amazing views of the ocean and of San Luis Obispo Bay. For now, I’m only posting a few pictures from Avila beach but pretty soon I’ll post my detailed Avila Beach travel guide. Enjoy my pictures from Avila Beach for now. Avila Beach, California – The pier and beach at Avila Beach on a cloudy day. Avila Beach, California – Street cafes and palm trees line up Front Street at Avila Beach. Avila Beach, California – Colorful houses on a street in Avila Beach.